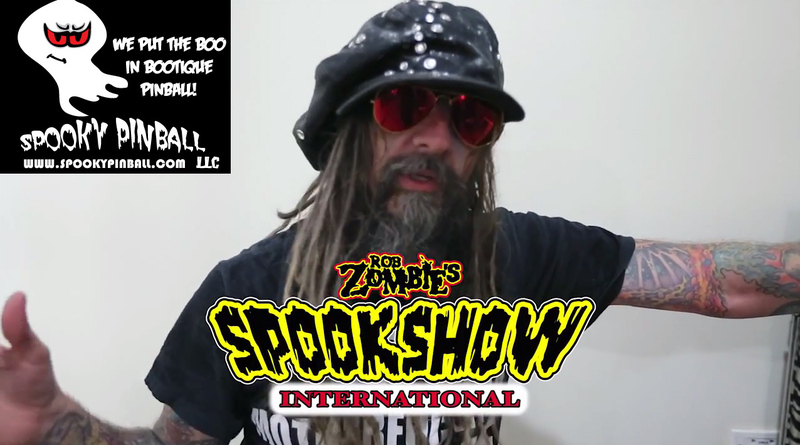 Today at the Rocky Mountain Pinball Showdown in Denver, Colorado, Charlie Emery of Spooky Pinball, LLC announced their next title: Rob Zombie’s Spookshow International Pinball! Fresh off the heels of a sold-out run of their first pinball game, America’s Most Haunted, Spooky’s ability to secure a licensed theme from the rock and horror icon firmly solidifies the Benton, Wisconsin company as a major player in the coin-op amusement marketplace. To coincide with the announcement at RMPS, Spooky Pinball released a teaser video announcing the game and gave us more information about what prospective buyers can expect. The video reveals that the production run will be limited to 300 (twice the amount of America’s Most Haunted) and will include 10 classic Zombie songs and custom speech by the artist himself! The Devil’s Reject’s actor Sid Haig will also lend his voice to the machine. Spooky has outsourced artistic talent to Alex Horley and toy design to Back Alley Creations. In the game you can battle Captain Spaulding to survive the House of 1,000 Corpses! The theme may not be for everyone, but with this limited run and the popularity of Zombie’s music and films you can be assured that this limited run will sell out. The production schedule is currently unknown as the Spooky crew have yet to complete shipping the remaining orders of their first game. With this game on the horizon, however, it is safe to assume Charlie and company will have their work cut out for them for the foreseeable future.